Talk about your mega B-list cast. 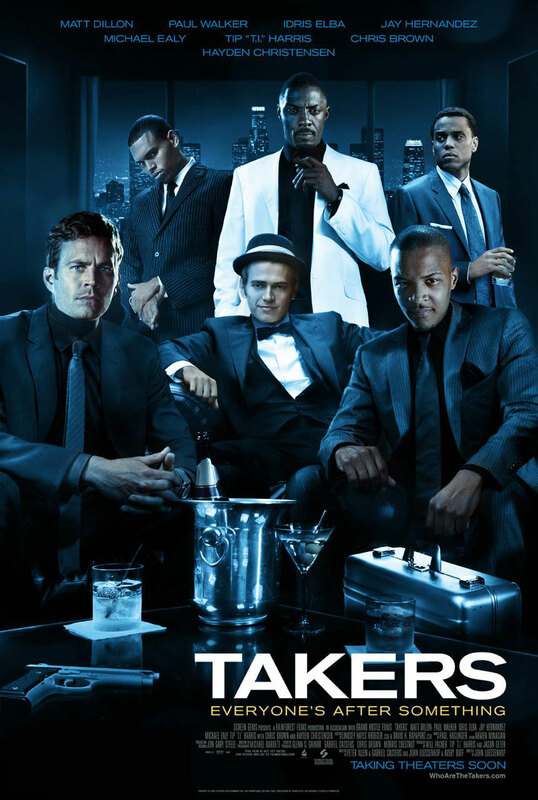 Takers leans heavily on style and attitude, the film won't win a single point for originality, but director John Luessenhop keeps the action rolling along regardless. 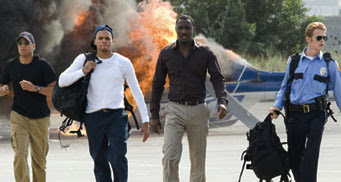 A crew of five high-living bank robbers (Paul Walker, Idris Elba, Hayden Christensen, Michael Ealy and singer Chris Brown) has managed to pull off several lucrative jobs through meticulous planning. But when a former colleague (T.I.) gets out of jail he suggests another score - their biggest one yet. At first the crew are a little cautious about this heist. However, going against their better judgement they proceed anyway. You know they are heading for trouble this time around, partly because of the tension among the thieves and partly because a pair of cops (Matt Dillon and Jay Hernandez) are hot on their trail. 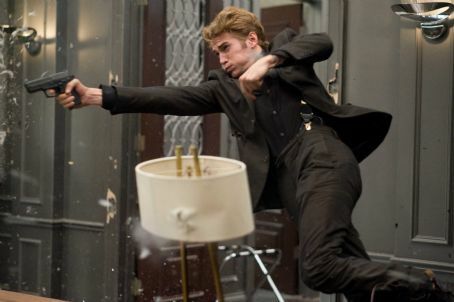 In addition, they have to d eal with Russian mobsters who want to get in on the sweet action. I found the storyline to be pretty basic for the heist movie, but the writers - Peter Allen, Gabriel Casseus - provided enough clever twists and character details to keep the audience engaged. The cast also helps to liven up the material. They may not be the best group of actors (ahem, Paul Walker), but they sure are nice to look at. I was actually impressed with Hayden Christensen this time around, which is saying a lot, because he has bugged me in the past. And of course Zoe Saldana shines beautifully in every scene she's in. This movie didn't get the best of reviews from RottenTomatoes - ranking in a low 27%. It's definitely a B-rate movie with testosterone written all of it, hands down, but I found it to be one healthy dose of entertainment. The stunt work is pretty amazing, and the pace is steady enough to keep you watching right up to the lame and somewhat ambiguous conclusion. Can't say I was happy with end result, but what are ya gonna do? It’s not a work of Oscar material, just a fairly simple film, convincingly acted and smartly paced. Sounds like an Ocean's movie, minus the cool factor. But it could be a fun way to twiddle away a couple of hours. Heck turn the sound off and just watch for the pretty! "Piranha 3D: For Your Consideration"